in the magnificant Jotunheimen national park! 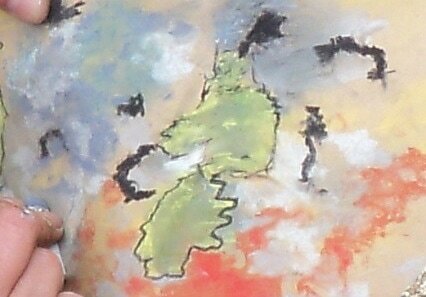 Wildpainting sets off in strong colours with the purpose to free the mind. 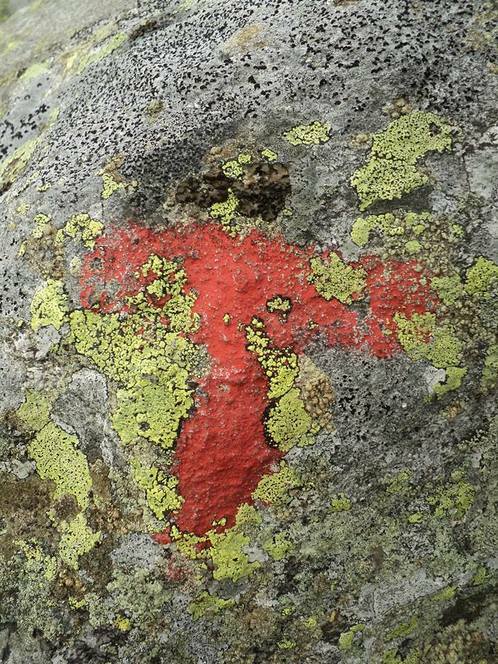 Wildpainting aims to paint on appealing locations that entice the senses, one way or the other. 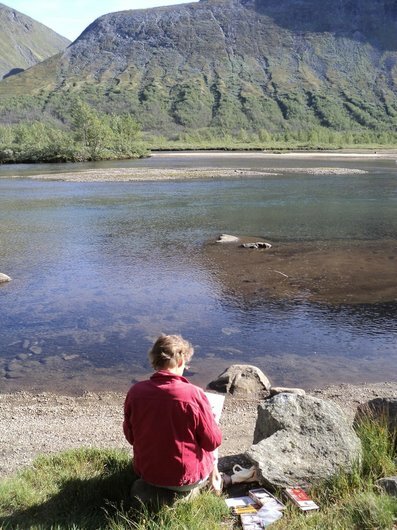 This 5-day Wildpainting course will be held between 12-16 August 2019. Participants arrive latest on Sunday August 11. The sessions – at least four hours per day – can be in morning or afternoon, depending on the weather (morning sessions between 9.30-12.30 and afternoon sessions between 13.30-16.30 pm). 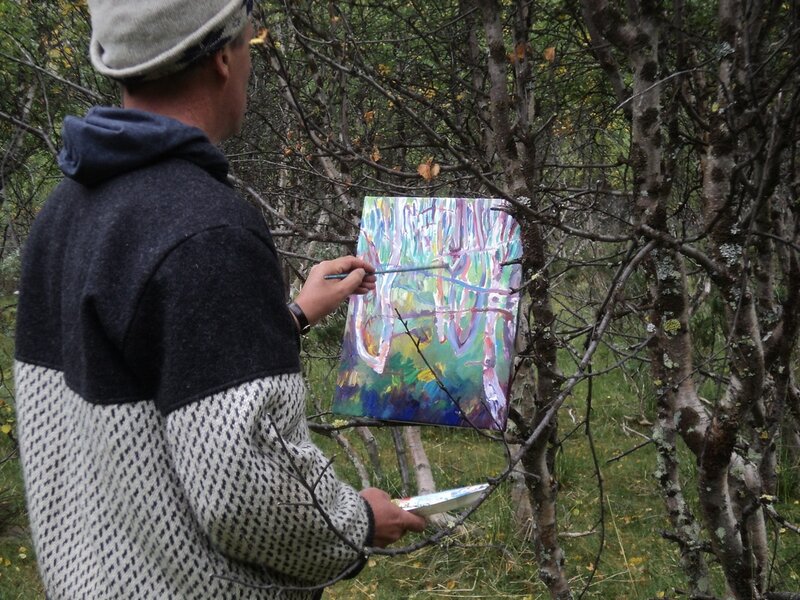 We will go out and paint in the stunning natural environment of Gjendebu turisthytte, weather permitting. The teacher is Jan van Boeckel, an experienced Dutch artist and art teacher. He has become specialized in facilitating wildpainting courses, focusing on drawing and painting closer to nature in a colourful way, and thereby using all of your senses. All participants will receive intensive personal tutorials as well, each on their own level. The workshops are suited for any enthusiast painter, beginners and advanced level alike. Notice: A minimum of 6 participants is required for the course to take place. The course fee is NOK 3500 (€ 360) - all art materials included (acrylic paint, paper, easels, brushes). Not included: lodging and food at Gjendebu. Reductions for children and for groups. You can stay overnight at the Gjendebu turisthytte (not included in de fee. Reservations recommended! Please email the owner of Gjendebu, Lars Åge Hilde, directly when booking your accommodation and he'll give you a special price. Observe: As a minimum of 6 participants is required for this course to take place, you're recommended not to make any bookings before you've received confirmation that the course will indeed take place). Gjendebu turisthytte is beautifully situated by the west end of the lake Gjende, in the geographic centre of national park Jotunheimen, which is the most famous mountain area in Norway. 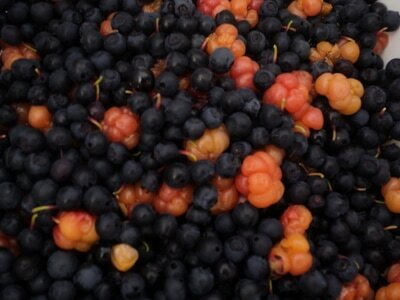 The origin of the word “Gjende” comes from “gandr” which means walkingstick. The lake is 20 km long and has the shape of a stick. 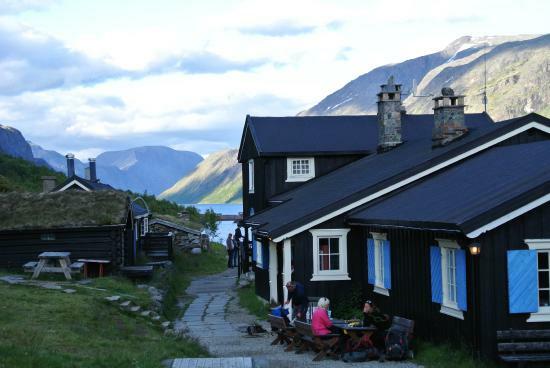 Gjendebu is the oldest of the huts belonging to the Norwegian Mountaineering Association (Den Norske Turistforening – DNT), established in 1871. The hostel has been rebuilt and extended a number of times, and today it has 119 beds. The area around Gjendebu offers possibilities for many activities, whether you peacefully want to enjoy the nature, study flowers in the nearby surroundings or go fishing in mountain lakes (licence can be bought at the hut) to daytrips to one of the many 2000m peaks in the area. Svartdalpiggen, Knutsholstind and Semmeltind are some examples of peaks that can be reached from Gjendebu in one day. And this year you will have once more the option to participate in Wildpainting sessions! 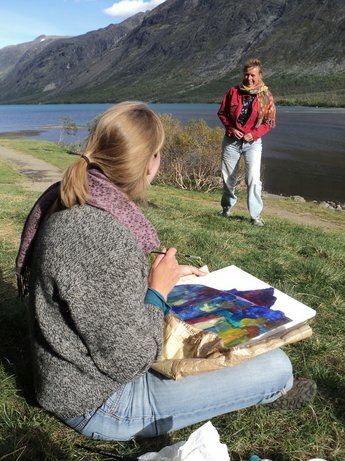 ﻿Wildpainting courses take place at different locations. 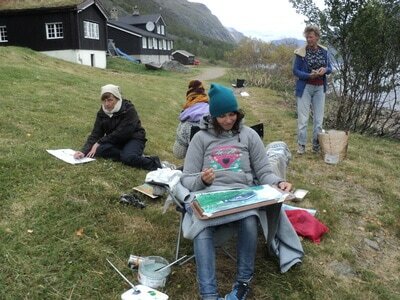 Get an impression of previous wildpainting courses. in the middle of Jotunheimen National Park. Gjendebu turisthytte is beautifully situated by the west end of the lake Gjende. Check the hiking map here. One can travel to Gjendesheim by car and leave the car at the long-term parking lot. A shuttle van takes you from there to the boat. 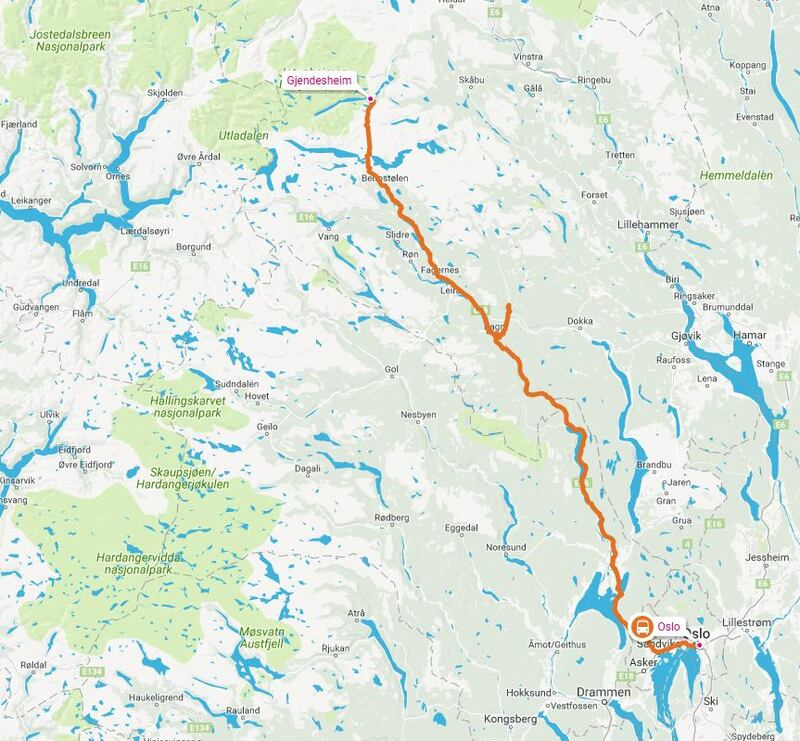 One can also reach Gjendebu by taking a bus from Oslo bus terminal to Gjendesheim, from there the boat across the full length of lake Gjende to Gjendebu hotel. The bus trip from Oslo to Gjendesheim takes four and a half hours, and is very scenic. Price is about 42 euros p.p. one way. Two persons travelling together will receive group reduction. If one leaves Oslo at 10:25 am, one arrives well in time in Gjendesheim (15:05 am) to be on the boat. The boat from Gjendesheim departs two times daily: leaving 07.45 am, arriving at Gjendebu 08.30 am, or leaving 15.20 pm, arriving at Gjendebu at 16.05 pm. The boat ticket costs about 21 euros p.p. one way. Tickets for both bus and boat can be ordered online. Booking a bus ticket online is cheaper than buying a ticket on the bus.